Thanksgiving is the time of the year you really want your table to shine and shimmer. Bringing great lighting to a table can make a setting warm and inviting. Turn off those harsh overhead lights and fire up candles on your table. 1 - Clear Glass Hurricanes are perfect for any table, and can easily be updated for the season and table setting. Just coordinate your pillar candle with your décor. In addition, you can also add natural elements such as sand or stones at the bottom for additional drama. If you want to add something instead of clear glass, consider a wire lantern. 2 - Candle Sticks are a traditional approach to table lighting. You can get them in any material and finish to coordinate with your décor. Add distressed candle sticks for that rustic look or add a multi-arm piece to add a different touch. 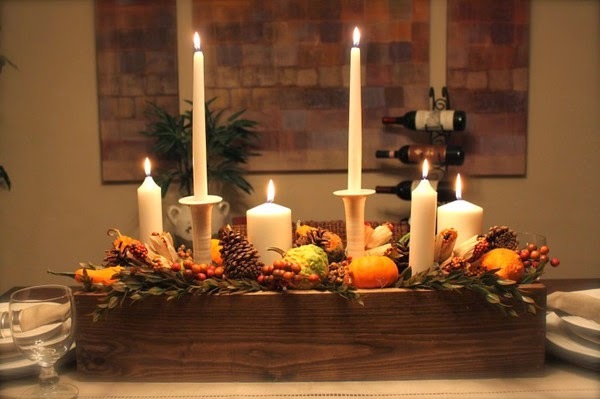 3 - Votives are a great way to add light accents all over the table. You can add a snap of color with a mercury glass votive or add some floral life with a ceramic rose votive. Votive are so easy and affordable, you can even give them as gifts for a host or guest. No matter that the approach, mix it up. A variety of lighting will make your table more interesting to look at and the atmosphere cozy and special!